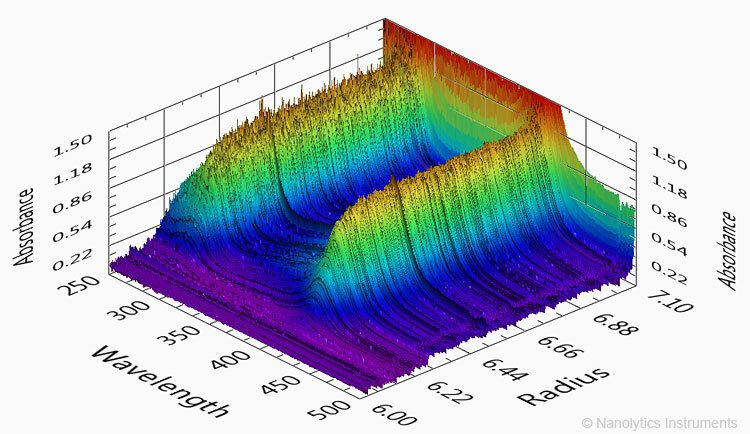 Nanolytics Instruments' MWA detector records spectra rather than single wavelength intensities. The information per scan is more than three orders of magnitude above that of a standard absorbance scan on Beckman's XLA. It records 2048 wavelengths between 185 and 894 nm simultaneously. Each single scan is recorded much faster than on other commercial instruments. The duration of a single scan at high resolution is shorter than one minute. The minimum stepsize is 10 µm, yielding more than 1000 datapoints in the typical range between 6 and 7 cm on the radial axis. Our detectors are mounted into used, refurbished and certified BeckmanCoulter preparative centrifuges. Our UC hardware partner will service and maintain centrifuges on location, whereas Nanolytics Instruments has the responsibility for detector hardware and software issues. Experienced users can purchase the detector hardware as a toolkit, allowing to mount the MWA unit into existing centrifuges and design individual triggering and software solutions. MWA information brochure for download (PDF | 4.7 mb).